Cosmos: A Spacetime Odyssey is both ambitious and quaint. It attempts to convey humanity’s most expansive ideas in the space of a weekly 44-minute TV series. That’s ambitious. The show is also unabashed in its commitment to truth—it matter-of-factly presents what we know about the universe, what we’re pretty sure about, and what we don’t know yet. Cosmos doesn’t hedge: You won’t hear the narrator, astrophysicist Neil deGrasse Tyson, neuter any of his statements with a gratuitous “some people believe…” counterpoint. He states the truth as a broad scientific consensus understands it today. In a media environment where truth has to compete with a “balance” designed to prevent hurt feelings, Cosmos’ straightforward tack is quaint—laudably so. The “cosmic address” sequence that opens tonight’s premiere is how Cosmos puts its best foot forward. Cruising in a computer-generated “ship of the imagination,” Tyson narrates a travelogue through space as we know it, one that begins at Earth and proceeds to the edges of the known universe—ending with a brief glimpse of a vast, theoretical multiverse. This is a visual-effects extravaganza, and Cosmos doesn’t hesitate to indulge in eye candy. But the true feat here is how Cosmos’ imagery overcomes our puny ability to conceive huge spaces. Each line on the cosmic address follows clearly from the last, and the sequence’s methodical buildup lets viewers acquire a sliver of insight into our universe’s baffling bigness or, to put it another way, our pathetic smallness. Tyson’s explanation of the comet-filled Oort Cloud that surrounds the solar system is rushed and confusing, a rare off-key moment in the opening segments. But that stumble foreshadows sloppy scripting that crops up more often later in the episode. The cosmic calendar is an elegant way to talk about the age of the universe without losing perspective in the boggling billions of years that came before us. Yet Tyson’s narration jumps fitfully between the contrived time of the calendar and the real time of actual history, which makes for a scattered presentation. The calendar segments are also hurt by a few hokey moments, like when Tyson slides on a pair of sunglasses, à la David Caruso, to watch the Big Bang. This silliness only distracts from what ought to be a moment of wonder. I’m quibbling. The cosmic calendar is still beautiful and moving. Sure, Sagan did it a bit better—although, frankly, his cosmic calendar journey was sometimes confusing, too—but each installment of Sagan’s Cosmos had nearly a full hour to work with; this Cosmos covers roughly equivalent ground in about 44 minutes’ time. And the thinking behind the sunglasses move is clear: Not everything can be stunning. The show needs to leaven its big ideas with grounded touches to keep its epic majesty from growing banal. That’s the rub. If there is one characteristic flaw in the show so far, it is a struggle to communicate on the human level as well as it does on the cosmic scale. This weakness is troublesome in the address and calendar segments; it becomes glaring in the middle portion of the episode, which tells the story of a 16th-century Dominican friar, Giordano Bruno. Imprisoned and ultimately executed by the Roman Inquisition, Bruno challenged conventional wisdom with his vision of an infinite universe full of suns and planets like our own. The Bruno story is animated, and perhaps this is the influence of executive producer Seth MacFarlane at work. If so, MacFarlane should have dipped a little deeper into his Rolodex. The animation is stiff, drab, and ugly—out of sync with the world-class visual effects that grace the rest of the show. That concluding sentiment aside, Tyson’s narration is at its worst in the Giordano Bruno story, with notes of condescension and hyperbole. At one point, for instance, Tyson adopts dire tones to cast Bruno’s persecutors as the “thought police,” which is pouring it on thick. The Inquisition does not need to be made more dystopian—it’s the freaking Inquisition. Tin-eared touches like these give the impression that the show is dumbing itself down for viewers, and while the line between dumbing-down and simplification may be thin, it’s Cosmos’ job to stay on the right side of the divide. Carl Sagan’s communicative gifts lay not just in his ability to frame science in approachable terms, but also in his delivery. While the astronomer’s odd voice—sounding like it got accidentally lodged somewhere between his throat and his nose—may have been mocked by comedians, it worked to his advantage. Thanks in part to that quirky speaking style and his gawkish overbite, Sagan was an earthbound personality. He didn’t came off as the vaunted expert speaking down to his subjects. He was a peer—merely another human, exulting with his audience in the marvelous truths that science has brought to light. Where Sagan spoke with a calm confidence, Tyson is often insistent. Both of them have earnest enthusiasm; Tyson is simply pushing too hard. Tyson may relax into his role as TV communicator yet, however. The premiere concludes with a remembrance of Sagan. Tyson recaps some of his predecessor’s scientific accomplishments, and then he tells the story of the first time he met Sagan. In these two minutes, Tyson finds a greater poignance than anything in the interminable Giordano Bruno sequence, and he does so by speaking from the heart about a friend. This echoes Sagan’s greatest gift as a communicator: He implicitly treated all people as friends, with a bottomless compassion for the human race. Tyson shows glimpses of that same affection, and the show could use more of it from him—not necessarily in an overt way, but detectable beneath the surface. The most inspirational moment of this premiere is almost a throwaway line, and it comes during an explanation of the Big Bang. “It’s as far back as we can see in time,” Tyson says. There’s a pause before he adds, “For now.” Two words speak to the fundamental hope—or faith, maybe—of science, which is that through hard work, we can banish the dark of the greatest unknowns. (It’s a notion that doesn’t have to be incompatible with religious faiths, as “Standing Up In The Milky Way” briefly acknowledges.) Is this the spiritual side of scientific endeavor? “Spiritual” can be a junk word, a self-descriptor used by people who don’t have religion but still believe in, you know, stuff. 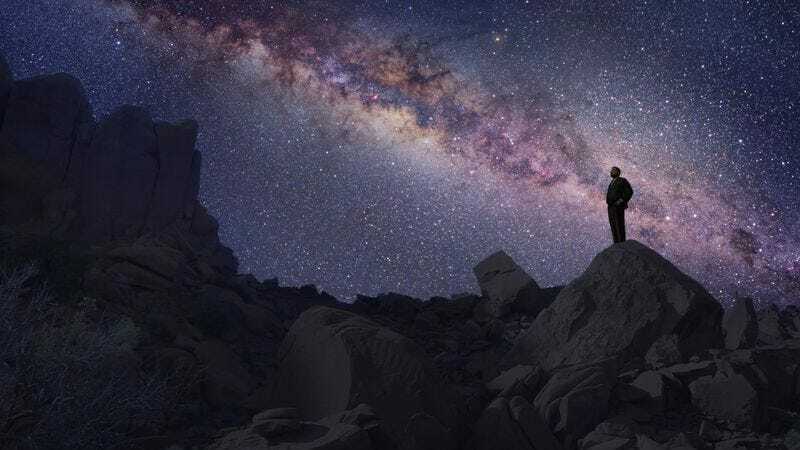 But if we define spirituality as the awareness of an order and connectedness much greater than ourselves, then yes, Cosmos is a spiritual show, and a mostly compelling one at that. Its gospel has the added benefit of being truth—or as close as we can come, for now.